More Berio Folksongs – not by Berio, but who cares? In the late 1980s to mid 1990s, the Italian music publisher Ricordi published a fine collection of Italian contemporary music, under the label Dischi Ricordi, which offered the opportunity to hear rare stuff by (then) rarely encountered contemporary Italian composers, Luca Francesconi, Giacomo Manzoni, Bruno Bettinelli, Sylvano Bussotti, Azio Corghi, Sandro Gorli, Salvatore Sciarrino, Franco Donatoni, Aldo Clementi, Niccolo Castiglioni and many more. There were circa 40 releases, and then, in the late 1990s, the collection changed presentation (from gray rim/blue title as on the cover photo, to various with red spine); with that, some discs from the earlier collection were reissued but not all, and to make things even more confusing some of the new releases were published under the same label number as some of the unreissued recordings from the earlier series. The present disc, CRMCD 1009, is one of the most original and appealing in the lot. 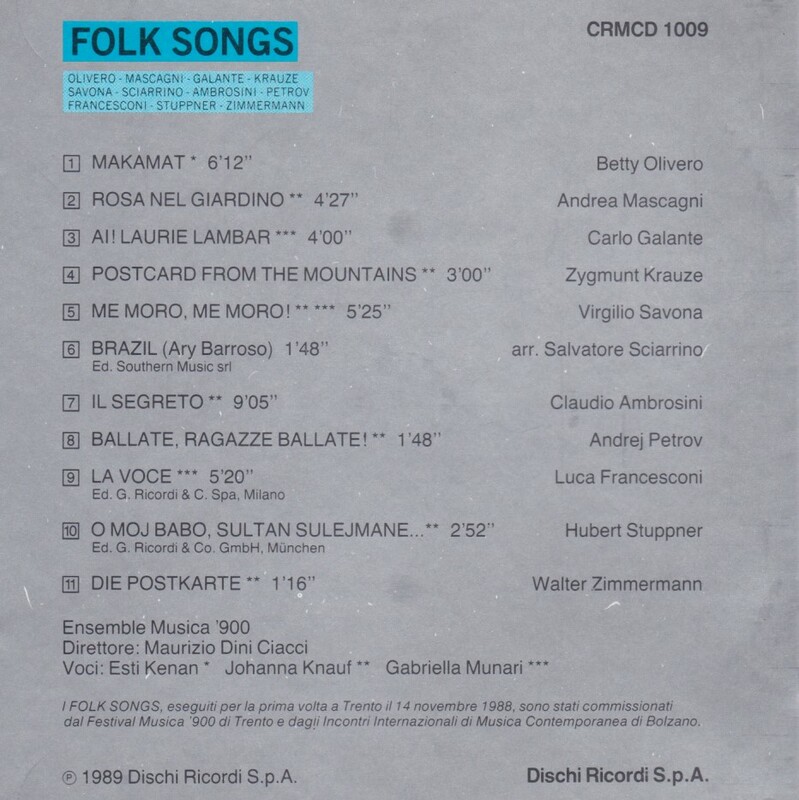 It originated from the 1988 edition of the “Musica `900 a Trento” festival, which commissioned eleven composers to write adaptations of folk songs, similar to what Berio had done with his own, famous cycle (Berio: Recital I for Cathy / Folk Songs / 3 Songs by Kurt Weill). The project was indeed an open homage to Berio, and even the choice of eleven composers refers to the eleven songs of Berio’s collection. Betty Olivero’s Makamat, which opens the disc, after fragments of Yemeni, Bedouin and Egyptian poetry, is as good as Berio’s Folksongs – the kind of thing you’d want never to end; the vocal delivery is genuine folk-Italian, all stops out, the kind of thing you could fancy hearing in the poor and run-down neighborhoods of Naples, and the instrumental accompaniment is fully contemporary. Andrea Macagni’s Rosa Nel Giardino (after a Hungarian folk song) has the sweetness and melodic appeal of a Canteloube Song of Auverge; Carlo Galante’s “Ai! 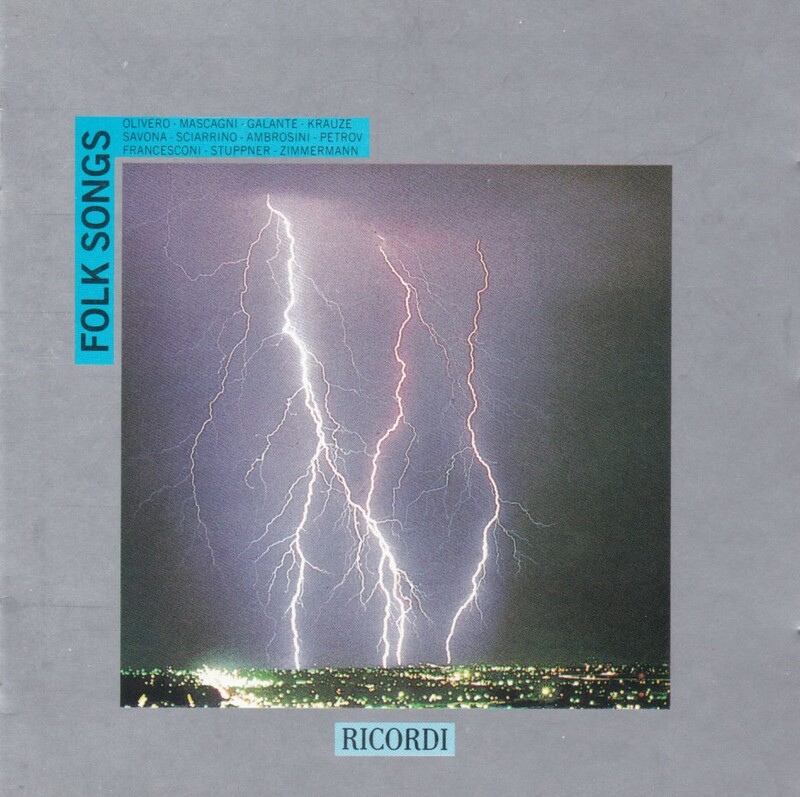 Laurie Lambar”, is, if I understand the liner notes, invented folklore sung in an invented language. It is delicately wistful and plangent, in the style of Berio’s “Black is the colour of my true love’s hair” or “I Wonder as I Wander”. Beautiful. Same invented folklore for Zygmunt Krauze, Walter Zimmermann and Hubert Stuppner. Krauze’s “Postcard from the mountains” starts vehemently, almost shouting, then continues in a terse mood, between lament and menace. Enigmatic and beautiful. Virgilio Savona’s “Me Moro, Me Moro!” sounds like an Italian commercial song – it even starts with the words “Mamma Mia!”. As ever, Salvatore Sciarrino is NOT where you expect him: his is the only arrangement which is not sung – it is a comical arrangement of a motif from “Brazil” – NOT the Terry Gilliam film, as I had once assumes, but the famous (not to me) song by Ary Barroso from 1939, Aquarela do Brazil (link will open new tab to Wikipedia). Claudio Ambrosini claims that his “Il Segreto” is inspired by oriental traditions, but whatever its folk origins these are entirely concealed, and the piece sounds like fully-fledged contemporary music – wild, but quite beautiful, I find, and great imagination and subtlety of instrumental color; running 9:05, it is the longest piece on the disc. The liner notes rightly point that Andrej Petrov’s “Ballate, Ragazze, Ballatte!” sounds like Stravinsky (and more specifically, his wonderful Russian songcycle Pribaoutki). Francesconi’s “La Voce” starts like a Stravinsky arrangement of a Sardinian Song, but ends in pure Francesconi – a great inventor of timbral colors in the manner of the radical Penderecki. Hubert Stuppner’s “O Moj Babo, Sultan Sulejmane” sounds like Mozart’s Turkish March gone wild, with great, colorful and clashing orchestration. Walter Zimmermann’s Die Postkarte is sung in German and the music is fascinating, in a repetitive-minimalist-obsessive manner. 1:15 of it is way too short. All this is varied, inventive and entertaining. Three female vocalists share the proceedings. Esti Kenan, singing only Olivero’s Maskamat, is entirely “Italian traditional” idiomatic, and she sounds great. Too bad she gets only one song. Johanna Knauf sings seven, she is a soprano singing with a classical technique and a pronounced vibrato, especially perceptible in Rosa Nel Giardino (track 2); it gets better after. Gabriela Munari is a mezzo with a touch of hard edge in her voice, and she is allotted three songs – she shares Savona’s song with Knauf. Her dark hues and chest voice are great in Francesconi’s La Voce. Texts unfortunately not provided, good liner notes, TT a meager 46:36 – Berio’s Folksongs could and should have been added, really. Too bad for the missed opportunity, I would have loved hearing Kenan sing them.